Last week, Boat Sales Blogger was looking at a Rival 41 with proven ocean-going and world-girdling credentials, and an accommodation layout with serious seafaring in mind writes W M Nixon. 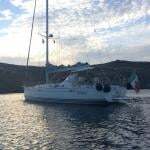 This week, we look at a boat of broadly similar overall size, yet although this particular vintage of the Bavaria 42 is well able for seagoing and several have crossed oceans, her layout is such that she will give best value when cleverly cruised along beautiful coastlines with comfortable nights berthed in port or at anchor in a snug haven. As she dates from 1989, she’s from the period when Bavaria’s in-house designer Axel Mohnhaupt was producing relatively hefty craft which weren’t afraid of having that inbuilt level of displacement which brings it own reassuring comfort and seakindliness with it. Twenty-eight years ago, nearly all the volume boatbuilders were providing craft which were generally heavier than those that they build nowadays. And though the newer boats may please the company accountants, as weight is expensive, while the marketing folk might like to promote the zippier performance which lighter displacement may provide, for a sensible cruising person a bit of weight in the right place makes all the difference to day-in, day-out liveability. That said, the reason we suggest this boat gives of her cruising best when port is made each night is because the main stateroom is forward. And that stateroom does indeed provide affordable luxury. But it wouldn’t feel at all luxurious when the boat is thrashing to windward out at sea at night, whereas nights in port would have real style to them. 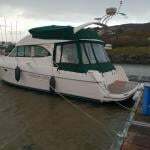 She’s located plumb in the middle of an area where a host of anchorages can be reached with a comfortable day sail, for although Hugh Mockler of Crosshaven Boatyard is the agent, this Bavaria 42 is in Lawrence Cove Marina on Bere Island in Bantry Bay. As Spring begins to creep in, you could have a most enjoyable scenery-laden weekend just going to see her. And with a price of €54,500, there’s more of interest than just spectacular scenery. Then too, she’s a classically handsome boat with it. For although the in-house design team looked after the details, I’ve a feeling she’s of that generation of Bavarias where the hulls were designed by Doug Peterson, no less. The Howth Yacht Club hosted the Classic One-Design Regatta - incorporating the National Championships of the Dublin Bay Mermaid and Howth 17 Footer classes. Download Mermaid results below. Even before you could see them, the vapour of varnish bumbled over the hills and lowlands into Howth. Facebook updates from sailors on motorways passing shiny timber creations confirmed that the Mermaids were officially on tour. Some arrived under cover of darkness and were only noticed early on Thursday morning with a full dinghy pen. Little sailors, just starting out on their sailing careers, couldn't even see over the gunwhales of these big dinghies. They oohed and ahhed at boats made from "actual timber?" Twenty-three Mermaids were weighed and plopped into Howth Harbour. Some of them had been here relatively recently (1953!) and wondered who had stolen Howth Sailing Club. HYC's Jedi, Neville Maguire was on hand with fellow Mermaid aficionados Gerry and Ian Sargent to poke and point and raise eyebrows at things called "Cleats". Under the care of National Race Officer Scorie Walls, Thursday's racing started at a polite 1400. Keeping the Northside flag held high, "Azeezy" from Skerries did the business with two wins from three races. Not content with competing with eachother on the water, the Annual Mermaid Table Quiz followed rehydration. In a show of poor manners, a table made up almost entirely of Howth 17 Footers won. A prize was awarded for the best answer to "What is the capital of Mongolia?" "Don't know, but it's got a lot of vowels and sounds fierce foreign". Two races for the Mermaids on Friday saw "Wild Wind" (Rush SC) and "Tiller Girl" (National YC) equal "Azeezy"'s daily tot of 6 points. The gap wasn't closing. Howth history in the making was being mentioned all week before the old ladies of sailing, the Howth 17 Footers, put on their Friday night frocks and took to the water for a single race from the East Pier. For the first time in history, 18 boats were afloat and jockeying for position. The busy start line was made slightly more complex when the class was given a downwind/ spinnaker start in front of the East Pier, with boats gybing and tacking simultaneously as they jockied for position with a minute to go. Almost inevitably for the class, the girls began the bumping and grinding before the start signal and "Oona" went for "Rita" like a jealous girlfriend. "Rita’s” stick-man, Marcus Lynch, found himself with a clip around the ear from "Oona's" bowsprit and was forced to retire with injured planks, cracked frames and a split rudder. Turns out that "Oona" picked the wrong girl to shout at and she broke her bowsprit in the collision. And so the anticipated race with the full compliment of the world's oldest one-design racing keelboats never quite happened. The remaining seventeen boats crossed the line with spinnakers flying and more photographers clicking than at a Justin Bieber underwear collection launch. Head girl was "Deilginis" with "Aura" and "Hera" following in her tracks. Saturday morning saw the Howth 17 Footers dressing up in their finest gowns and bonnets and gliding like debutants to the dancefloor. "Hera" lifted up her skirt and frightened the girls by winning by over two minutes. The brazen thing. She would have to have her cough softened! "Deilginis" took back control of the crowd in Race 3, trailed by "Gladys" sporting her 2016 Spring/Summer collection. The Mermaids were on the far side of the trapezoid course and only crossed the Howth 17s at the leeward mark and short beat to the finish. It was likely that some Mermaid sailors were checking their insurance when they saw the 17s approach! Top Mermaid of the day was "Vee" (Rush SC) with a 1st and 4th. "Wild Wind" and "Tiller Girl" produced some magic to close the gap to leader "Azeezy" but it wasn't to be enough to rein in the eventual Champions. Back on the Howth 17 course, "Leila" and "Aura" sobered and took the last two races, and "Deilginis" was to take the 2016 title. Class Captain, Tom Houlihan, took the Handicap prize aboard his "Zaida". As the last of the Howth 17 sailors were plucked from the moorings, the Mermaids had already already been craned out and packed up, setting the scene for a packed balcony in glorious sunshine. Rehydration once more! 170 sailors and their entourages filed into the club dining room to be fed, found, watered, awarded and clapped at. Champion Mermaid sailor Sam Shiels pronounced an epic acceptance speech. His Howth 17 opposite, Luke Massey, countered it with an example of brevity and raised the trophy aloft. The next Classic One-Design Regatta will be held at Howth Yacht Club over the weekend of 10-12 August 2018. The wingsail on ORACLE TEAM USA’s racing yachts and the wings on airplanes operate in similar fashion. As Ian “Fresh” Burns explains, a significant amount of force is generated to propel the boat faster or lift a plane off the ground. And, the team is utilising the aerodynamic know-how of Airbus to help achieve optimum performance on the water. Who needs an engine, these days? An Irishwoman has died after a yacht capsized and broke into pieces in South Africa. The 49-year-old woman was on-board the boat Tara in the early hours of yesterday morning with two other crew members when the incident occurred according to the Irish Sun. The boat turned over between Melkbosstrand and Yzerfontein on the West Coast in Western Cape. A 66-year-old Irishman, who is a resident in the area, managed to swim to the shore and raise the alarm. However the Irish woman and a Scottish male were killed in the incident.